Electricity in Your Life draws attention to an abstract and often overlooked concept in children’s books. 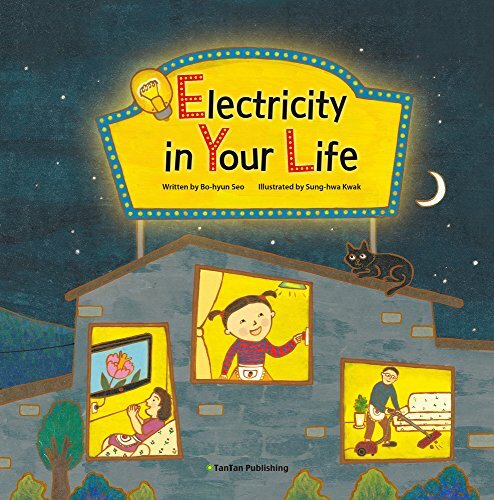 This nonfiction journey of electricity introduces children to the plethora of gadgets in everyday life that feed on the energy provided by electricity. It traces the generic path that the wires take from source to plug, but offers little as how electricity is actually harvested or incorporated into a device. Instead, the book blandly states that if something has a plug, it needs energy. The book opens with the words “Strawberry Jam, Toast, and Cartoons.” These have nothing to do with electricity, one might think, but then one sees a young girl clicking on the lights, taking jam out of a refrigerator, toasting bread, and eating toast in front of the television, hence making the unnecessary connection between jam and electricity. Jam, toast, and cartoons are employed as a false attention-getting device to attract the reader when electricity itself is sufficient intrigue. Once the girl has her snack, the page turns and we see the living quarters of her family. Clearly, every electronic item is in use. The toaster, the microwave, the stove, the vent hood—all plugged in and operating. Mother is scooping rice from a rice machine. The electric tea kettle is whistling. Father is vacuuming. The humidifier is treating the air that the air conditioner is drying out. The computer is on, the lights are on, the TV is on. All of the cords and outlets are in the illustration and this feels very loud with energy. Life is humming along. And the girl is on the sofa eating. Eating to get energy to live, to color, to stack blocks, to ride a bike, to take a bath, to read a book, to jump rope (all ironically non-electricity entertainments). Then the book comments that just as the girl needs food for energy to live, all of the electronic devices need electricity to run. Not until the girl takes an inventory of all of these devices does she begin to wonder where electricity comes from. Then answer: a long wire. Then the reader is thrust upon a road trip to see a hydro power plant (from the outside) and drones on dully following the power lines leading back into the city where everyone is consuming electricity. Hospitals, factories, subways, malls—all have wires hidden in their walls or underground. Back into the home the reader once again sees the girl watching cartoons from her TV, plugged in to the outlet, connected to a meter box on the outside of the house, consuming energy. Suddenly, the lights go out, the electricity has failed. The book takes an abrupt turn now away from consumption toward conservation indicating that because it is annoying to be without electricity, one should make efforts to conserve it. There is a final plug for safety and a nod to the battery as portable electricity. The blurb for the book claims to be an “accessible science text for curious minds . . . that will get kids interested in discovering the way their many devices work.” But reader beware, there is little of scientific interest here for them to take away. More pertinent perhaps than an investigation into the sheer number of items that require electricity, would have been an actual diagramming of how the electricity is generated, transferred, and processed. Pity the illustrator didn’t employ her talents to this effect. In addition to the watered down “science,” the case for conservation is moot. In the U.S. there isn’t even much risk of blackouts in general. According to a 2014 post on Mental Floss, Roger Cormier lists the 12 worst world power blackouts of all time. Only two were located in the U.S.—one in 1965 and another in 2003. While the power may have gone out from time to time, most U.S. first graders have never even experienced a widespread blackout. Finally, implying that blackouts are caused by household overload is also misleading to the reader. Of the 12 worst blackouts just mentioned a whopping two of them were caused by the power grid being overloaded by demand. The others were caused by malfunction of processing plant equipment or interference of the lines with another object such as tree branches. Inside Energy, an industry watch dog that studies electricity usage and trends, reported in 2016 that while power outages are on the rise in the U.S., they are due to an increase in tumultuous weather patterns such as hurricanes, ice storms, earthquakes, and humidity interference. In other words, there is little a six year old can accomplish, by unplugging their iPod charger, to conserve energy. The point of all of these statistics is that this nonfiction book on electricity touches on nothing factual and goes no further in explaining electricity than the plug and the wire. This book may be suitable for preschoolers, but the school aged learners will be left unsatisfied and unengaged.